A few of the signs that can indicate a diagnosis of diabetes include loose teeth, dry mouth, and receding, dry, and bleeding gums. Poor immunity and an inability to fight disease effectively also make it much more challenging for wounds and gum line infections to heal in diabetic patients. Bleeding gums don’t always mean that you have diabetes; this problem can also come from gingivitis and other gum diseases. However, these early warning signs might cause your dentist to encourage you to visit your primary care physician for a blood glucose check. If your dentist spots any troubling signs of infection in your mouth, they might prescribe some antibiotics to fight the problem. You could experience an oral infection after a dental procedure, trauma to your mouth, or other problem. Signs of infection include severe pain, swelling, redness around the affected area, a surface that feels hot to the touch, fevers, and drainage from the wound or tooth. Infection can spread to other parts of the body, including the lungs and heart, so it’s critical to treat it right away. Oral cancer is the sixth-most common type of cancer diagnosed in the U.S., with more than 30,000 new cases being reported each year. When you visit your dentist twice a year, he or she can look for signs of this disease. Most cases appear as red and white lesions on the floor of your mouth, palate, or the tongue. Risk factors that increase the chances of oral cancer include heavy alcohol use, smoking, and exposure to HPV, the human papillomavirus, which also causes cervical cancer. 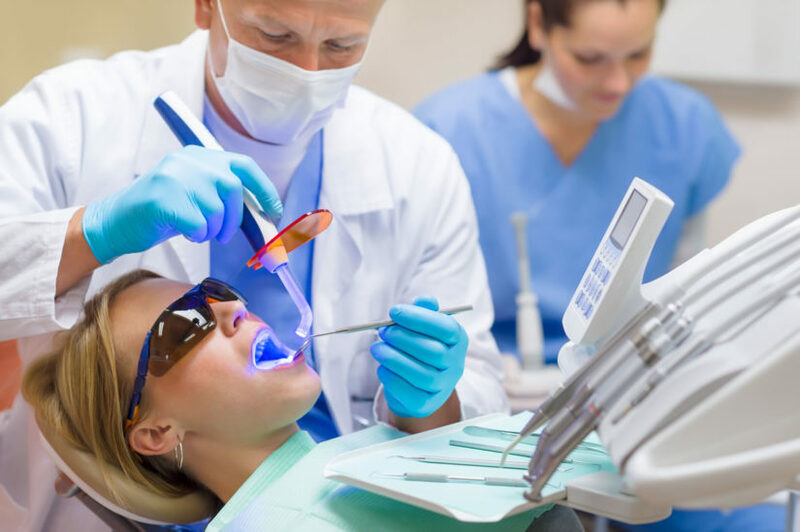 A dentist can perform an oral cancer screening if any warning signs are present. Some oral conditions may indicate that a patient is suffering from HIV. In pediatric cases, patients might have salivary gland swelling, which can result in a dry mouth. Children infected with HIV are often more prone to oral lesions and viruses, such as herpes simplex, herpes zoster, HPV, and oral candidiasis. Adults with HIV might exhibit signs like oral warts, lesions, white, red, purple, or brown spots on the tongue or in the mouth, and other infections. According to some studies, necrotizing ulcerative gingivitis or periodontitis occurs in up to 2 to 6 percent of HIV-positive adult patients. These symptoms alone don’t necessarily mean that you have HIV, although a dentist who spots one or more of these signs might recommend seeing your primary care physician for a blood test. Anyone engaging in risky behaviors should be tested for HIV regularly. When you have a stressful day, week, or month at work, your body may respond in ways that manifest in your mouth. One of the most common physical manifestations of stress is a condition called bruxism, or the grinding of your teeth. You might grind your teeth when you’re feeling stressed, but if the extra pressure is affecting you on a subconscious level, the habit may only occur when you’re asleep. Grinding your teeth can do serious damage to your pearly whites, so a dentist will often recommend a customized night guard for protection. It’s also smart to seek counseling, make lifestyle changes, or look for other ways to reduce your stress. Patients suffering from eating disorders or getting poor nutrition also show signs in their mouths. Most people who suffer from bulimia will do everything they can to hide it from others, but it’s hard to hide it from your dentist. A dental professional knows what signs to look for, such as dry mouth, bleeding gums, and erosion on the insides of the front teeth. Stomach acid is hard on the enamel that covers your teeth, so forced vomiting can wear away that protective enamel and cause increased sensitivity. Osteoporosis is especially common in post-menopausal women, although this weakening of the bones can happen to just about anyone. Your dentist might notice signs like loose teeth or a receding gum line, which can indicate changes in the bone that supports your teeth. When a dentist spots these signs, especially in a patient at higher risk for osteoporosis, he or she will usually refer you back to your primary care physician for a bone density test. Keeping up with regular dental care comes with a number of advantages. Your dentist can watch for changes in your mouth, some of which can indicate more serious problems. A dentist might be able to catch problems early, allowing you to seek treatment right away for more successful outcomes.